Safe Water Technologies Residential Sediment Filters are built utilizing SWTs FilterEase™ filter media. 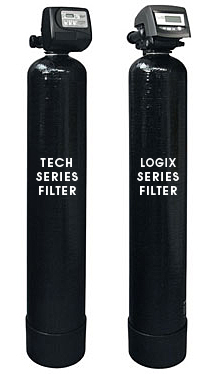 These filters are designed to remove ferric iron, silt, and turbidity. Sediment filtration as low as 10 to 20 micron is common. Plus, these systems feature SWTs Cyclonic Distributor System™ to provide full bed contact, less channeling, and superior backwashing.  For superior filtration, reduce flow rates by 1/3 of the standard flow rate specification. All systems have other piping connections available. All pressure vessels are wound fiberglass composite tanks with copolymer polypropylene liner and are NSF® listed. FITTINGS Click to view all Fitting Kits listed below. This environmentally friendly design offers the most efficient service and backwashining characteristics available — reducing the amount of water to drain in backwash, while increasing the overall filtration capacity of a system. Click here for more information.